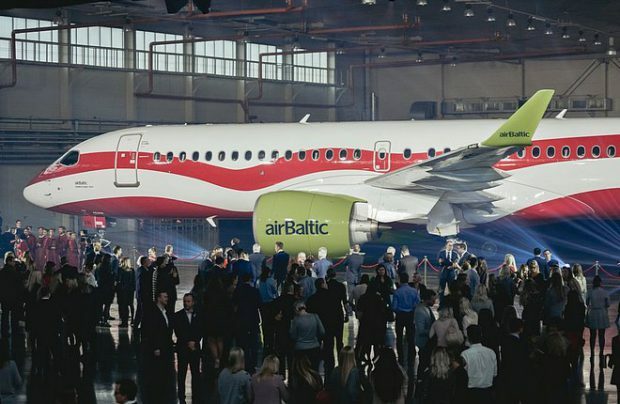 airBaltic, Latvia’s biggest airline, presented a gift to the nation on the celebration of its centenary by sporting a special livery on an Airbus A220-300 aircraft at Riga International Airport on November 9, 2018.
airBaltic’s Airbus A220-300 (registration YL-CSL), one of 13 of the type that the hybrid carrier operates, is now bearing the flag of Latvia and the name of Riga, its capital city. 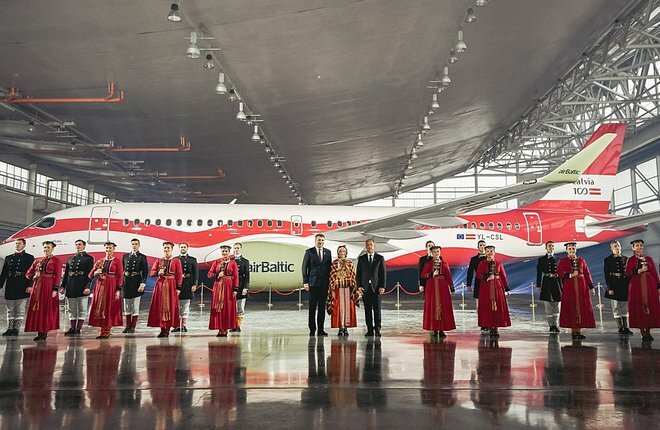 It is the first time in the history of airBaltic that an aircraft has carried artwork containing the Latvian flag national symbol. To create it, 15 professional painters worked 1,000 hours and employed a total of 250 litres of undercoat, top cover paint and lacquer – constituting a layer of 120 microns or 0.12 mm – were used to decorate the aircraft. The work was done at the base of Estonia’s Magnetic MRO with a support of AkzoNobel. During the first nine months of 2018, airBaltic carried some 3.17 million passengers, 18 per cent more than in the same period last year. The carrier’s fleet currently consists of 36 aircraft of four types: 13 Airbus A220-300s, five Boeing 737-500s, six Boeing 737-300s and 12 Bombardier Q400 next-gen aircraft.